Over 1300 students have been registered at this point! If you are still receiving emails from the HUUSD about registration, you have not completed the process. 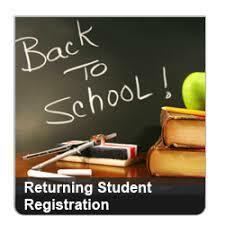 You will use your PowerSchool Parent Account to access the Registration form. IMPORTANT: Students new to HUUSD schools for 2018-2019 will not need to register. That includes new preK students. Create a PowerSchool account and link all of your children to it. You will use the Access ID and Password provided by your school registrar to CREATE an account, not to sign in. Sign in to PowerSchool with your username and password, scroll to the bottom, and click Returning Registration on the left. If you do not have a PowerSchool account, follow these instructions to create one. The instructions also explain how to add additional children to your current account. The final part explains how to begin online registration. After you have submitted a form for one student, you will be given the option to submit a form for additional students. PLEASE provide as much data for your child(ren) as possible. If you have any questions, contact your school's office. Contact numbers are farther down the page. I discarded the paper that listed the Access IDs and Access Passwords for my student(s). That's OK. Just call your school registrar and she can give you the information. I can’t remember my login for my PowerSchool Parent Account. If you aren’t able to retrieve your login credentials using the “Forgot Username or Password?” link on the Sign In page, please contact your school directly for assistance logging in to the Parent Portal. Will I need to do this for each child? Yes, because you’ll need to provide information that is specific for each child. What if I do not have Internet or a computer? If you do not have access to the Internet or have a computer, contact your school.